I Want to Build a Backyard Multi Sport Game Court - Now What? You've been thinking about building a basketball court or multi sport game court for your kids, and you don't know where to start, how much one costs, or what's involved in building one? Should you hire someone to do it or is this a job you can take on yourself? This site will help to answer those questions and walk you through the decision making process as well as guide you through the construction. We're also available to answer any questions you have. Start by thinking about what you want. Is this going to be a place for the kids to just shoot basketball, or do you want a court large enough for the whole family to play center-net and paddle sports like paddle tennis, volleyball, badminton, pickleball, or short-court tennis. Larger rectangular courts are also good for games like hockey or shuffleboard. As the court gets larger, some choices are better than others, like concrete or asphalt for a base is more expensive but also easier that trying to perfectly level 1800sf. A frequent question is "what is the cost per square foot for a multi-sport game court"? And when deciding on what type of court you want, it helps to recognize the two limiting factors - space and money. Go out and look at the area of your yard where you envision the court. Measure the space you've got to work with. You might find that you only have 20 feet between trees or a certain number of feet on the side of your house. So measure first. Using a tape measurer is the most accurate method, but you can also just walk it off, and estimate roughly 3' per pacing step. This will give you an idea of the overall dimensions of the court you want. (Estimates are okay for rough ideas about the cost, but you'll want to actually measure before you go too far in the planning). The second limit to identify is cost. Even the family with acres of yard available has a budget in mind. Once you've identified a dollar amount, you can also work backwards to identify the size court you can have. 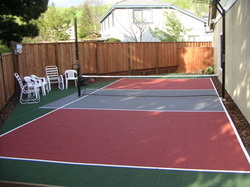 If you have a budget in mind, you can also plan to build your court in stages. It might be smart to do all of the concrete work first, put up a hoop, and enjoy the court like this for a year. Next summer you can add a sports tile surface, a light, ball containment, or landscaping. Not always. If you've spoken to a local gamecourt salesman, they probably told you that concrete is required, but that's not always true. Contractors like to use concrete because it's permanent, and won't create a callback next spring if you misjudged drainage. Using concrete also gives the salesman an opportunity to add 20% to the concrete subcontractor's price. In the last few years, additional products have been introduced as substitutes for concrete. We believe that using a system with encapsulated sand or compatible material offers many advantages as well as a cost savings opportunity. In many neighborhoods there are limitations on the total percentage of impermeable surface your lot can have. If only a certain amount can shed water, you have to tally up the footprint of your house, the driveway, sidewalk, and patio area, and then subtract that from the limit. While a compacted base won't last 50 years like a concrete pad, for many families that's a good thing. If you're renting the house, or your kids are going to be leaving home in a few years, a less permanent base could be the best choice. And it's a fraction of the cost of using concrete! Concrete: This varies around the country and will depend on the site conditions in your yard (what has to be done first - leveling, tree removal), and access. Call and get a few estimates. We have concrete slab specifications available to download and present these to the concrete contractor. Expect prices to range between $2 per sf and $8 per sf, depending on your situation. Compacted Base: If you choose a compacted base instead of concrete, your cost for this phase will be 10-25% of the cost of concrete. You'll still need to prep the area (level, remove sod, etc.) and you'll need approximately 1 cubic yard of compact-able material (limestone, recycled concrete, gravel, fines, etc). for every 80 square feet of court. You'll also need form boards, a wheelbarrow, hand tools, and rental of a vibratory plate compactor. Sports Surface: If you buy your sports tile from a local dealer, expect to pay $4-$6 per sf. They'll try to steer you away from online retailers but that's because they're not online retailers. There are several Made in America tile sports tile companies that sell direct and save 15% - 40% off the price of buying from a distributor or dealer. Gamecourts.com offers new sports tile for less than $3 per sf and Court Tile Discounters has used tile at even greater discounts. Components (Hoop, Light, Net Post & Net, Fencing, etc. ): Basketball goal systems are like bbq grills. There are $99 versions that last a year+ and serve the purpose, and there are $2000 models that last a decade or more and satisfy the professional. If you have the money in your budget, a nice goal is well worth the money, but if you're trying to do this project for as little as possible, you can always upgrade the components down the road. And just like the sports tile, check out the online retailers with models every bit as nice as the local dealers, and at substantial savings. Labor to Install: Installing the components can require heavy lifting, and concrete. So if you don't hire someone to do it, you'll want to make sure you have plenty of help on hand. Snapping the sports surface together is easy, fun, and goes pretty quickly. This is the part of the job the kids will really enjoy and it will give them a real sense of ownership in the court! Other tasks, like painting lines and installing ball containment are not that difficult. Most customers do it themselves and enjoy the process. But you can always find someone willing to take care of whatever portion you don't want to do. All material contained on these pages is copyrighted and may not be reproduced without the expressed written permission of the owners.